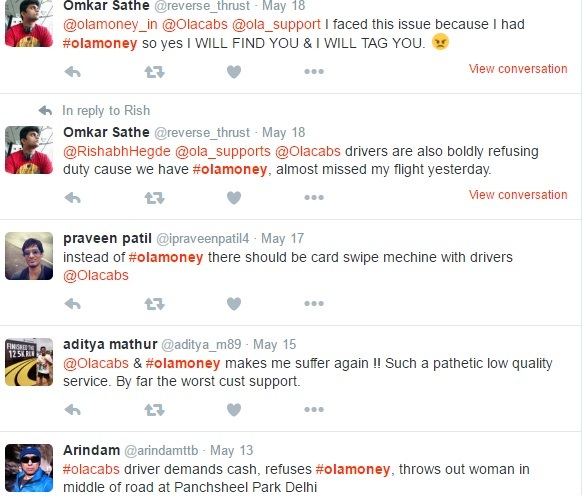 Looks like Ola's wallet, Ola Money has a series of issues that affect both driver partners and customers. This post lists those concerns and possible resolutions. 1. Ola Money directly deducts amount without any confirmation from me. It assumes system is always right. If I have any dispute about the amount, I don’t have any way to hold the payment. 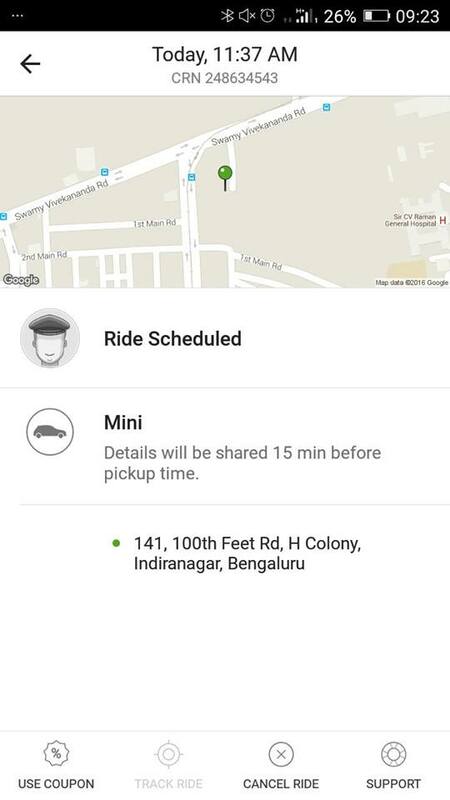 Even if ride doesn't arrive but driver has marked ride complete, money is gone immediately. Then I have to raise a ticket and wait for few hours to few days to get it refunded. Like how credit card users are required to enter a PIN/OTP, there should be a confirmation step in my opinion. 3. Gone Forever: Once money is credited, there is no way to get it back to our bank/credit card account. Credit card transactions can be reversed, so why Ola insists money credited into Ola Money account can never be refunded? I feel it is a trap and discourages me from putting more money into Ola account. Once my current balance is used, I may not recharge again. 4. Discount process is complicated: Ola promises 5% discount if paid via Ola money. But this is a complicated process. For each ride I need to use the code like OMSAVE etc. When you are in a hurry to book, this step adds unnecessary complications and waste of time. I took some time to figure this process out, so lost out on money saving opportunity during several rides. Instead, why can't Ola credit the discount amount upfront on recharge? Like if I recharge with Rs 1000, credit 1050 to my Ola Money Account. Do you agree with above? Did you face any other challenges with Ola money? 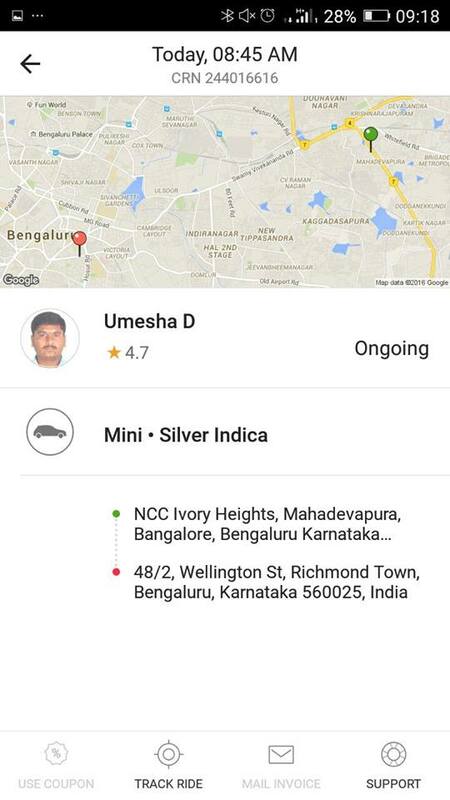 Drivers' concerns with Ola Money! No cash left for food and fuel: If 2-3 out of 12 rides are Ola money, then drivers have no problem. But if 8-10 out of 12 rides end up to be Ola Money, then driver is not left with enough cash for fuel, food and other immediate expenses. 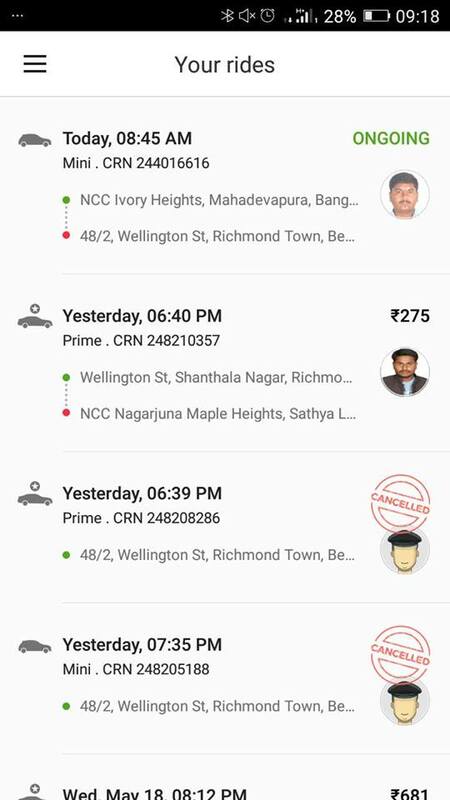 Ola takes several days to credit the money back to driver's account, after deducting its commission and other receivables. Because of this delay, drivers hate Ola money. Assume it is 11 PM in the night and despite working since 4 AM, driver doesn't even have 500 Rs in his pocket- how will he tank up for next day, how can he guy goods required for his home? He is forced to borrow money- sometimes at interest. Delayed payments- As against promised 48 hours, drivers claim it takes much longer for money to reach them. 2. It gets upper edge over driver settlements- if cash payment, Ola has to collect from driver, with Ola money, Ola is the master and will have more control. 3. Having some money in Ola Wallet forces consumers to consider Ola first instead of going to competition. An Indian Express news report on this topic can be read here. Ola is best topmost taxi service provider. Hope they will make their services better and will look into all the problems riders are facing. These things can be improved if Management wishes to. yes .. the option of paying by OLAmoney or cash or CC should be there. Also, apart from crediting OLA money immediately, how about promoting OLAmoney for buying fuel and daily expenses for drivers. Cash sometimes gets inconvenient because of change-problem, security issues etc. Very well covered .. Yes , I have faced similar issue at multiple situation . At the end of day " CASH is King " and wallets have a long way to go before becoming our mainstream mode of payments . And yes if there is 5% discount , do it directly rather than asking to input discount code every time . @Sandeep- I don't think that will be good idea. 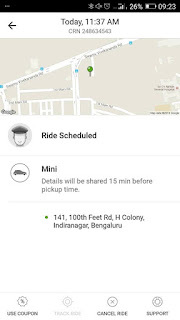 Ola will then have to deal with more vendors and stakeholders, bringing in more complexity. Already there are many channels- cash, credit/debit card, sodexho, fleet cards, loyalty cards etc.. No need for one more. Early Morning trips are always cancelled by Ola leaving the cusfomers high and dry. There will be an automated email from call centre saying the driver has cancelled the trip and looking for another cab. Many of my colleagues have experienced this. We need an option to get back my money from Ola Money. Correct. They only refund if customer complains. In my opinion they should add a compensation element too- just like how they charge a cancellation fee. Same with me boss.I loaded the wallet in the ola share journey. 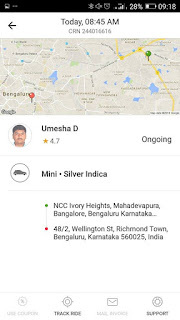 Ola share doesn't start without payment.I had payed in cash and the driver acknowledged on his phone still der sucker system has taken money from wallet. Once the driver acknowledged that he has "cash collected" the transaction should be over. Hmm, app would have shown amount to be paid- both to driver and to passenger-little carefulness could have saved the trouble. I think the driver tricked you well. Usually they refund upon complaining. Strange that they responded differently. But total calculation is instant and app shows amount payable as zero if already deducted from Ola Money... so why would you pay in cash again? 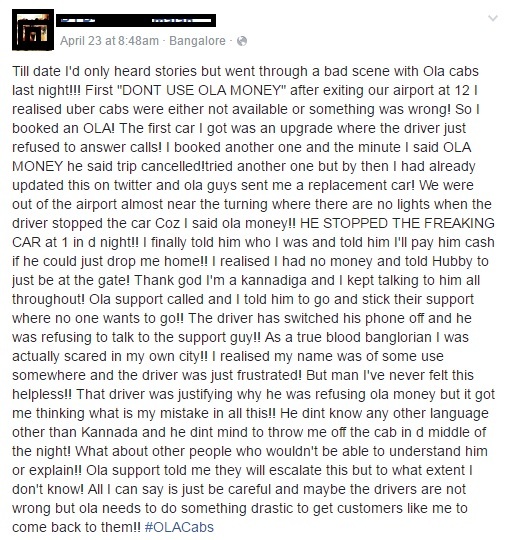 Ola has a very big issue. If you order the share cab with ola money and have no money in the wallet. The driver will insist om cash payment before he begins the trip. After you pay him in cash and he acknowledges through his phone "cash collected" and then "start ride". Still it doesn't stop here. Now if you load your wallet in the ongoing trip. Ola will deduce money from ola moneg wallet coz you had selected ola money in the beginning. No matter the driver himself acknowledged that he had collected cash still they deduce the amount and never give it back. They will ask you to contact the driver. Time for Ola to sort out their process! I faced this ola money problem today and for the past 6 months. And ola doesn't care to take action in this matter. After all the complaints I raised, I didn't even get computer generated reply. Frustrating. Where to complain about ola mobey retrieval problem? What's customer relation manager's email, phone etc. Whether to take matter to consumer court or police? Want specific guidance. Ola money is buggy app and very much vulnerable for hacking . 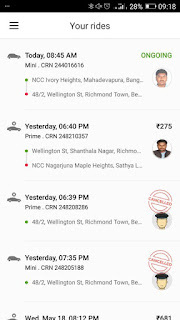 i lost INR 2000 because of this scrap Ola money app. Will never use this in future. Thanks for sharing your experience. Hope you'll recover your money soon. Keep us posted. Most blatantly illegal is the auto-renewal of share pass without customers consent. Money is deducted from ola wallet every month without customers consent and without the service being used.